The date is set and the clock is counting down. If all goes to plan and he can avoid injury along the way then in 50 days’ time Tom Boonen will be on the eve of Paris-Roubaix and retirement, pinning on his last set of numbers. He’ll be missed by many, especially the Belgian media and the Quick Step team who lose their totemic rider. Boonen’s status in Belgium is above and beyond every other rider. The likes of Greg Van Avermaet, Philippe Gilbert and Sep Vanmarcke are rightly respected but arguably their combined media profiles don’t reach the heights of Boonen’s popularity. “Golden Greg” has gone up a level since his Olympic win but they don’t seem close. There are even several Tom Boonen songs, take your pick from folk to rock to trance. In recent years Boonen has been tracked by the Belgian media every spring. Even an innocuous crash in Oman makes the news back in Belgium as Dutch journalist Raymond Kerckhoffs noted this week when he wrote about the Tom Boonen Circus in his De Telegraaf column. Boonen’s crash wasn’t just “cyclist crashes” clickbait for Belgian sports websites, it made the headlines on the evening TV news bulletin alongside the Publifin political scandal in Flanders and the resignation of Donald Trump’s national security adviser Michael Flynn. Boonen’s status owes itself to several factors. 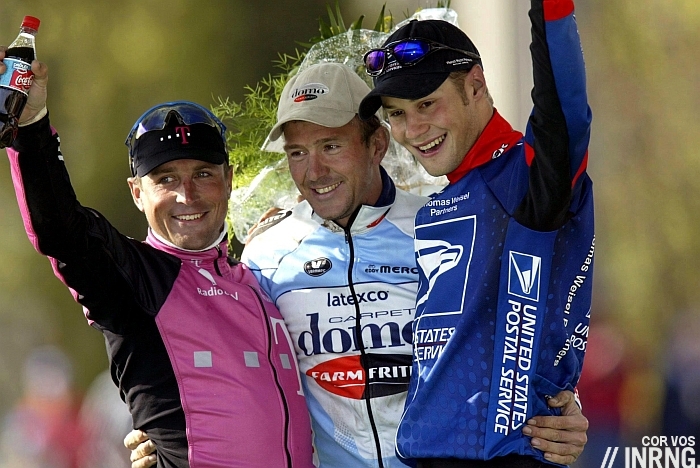 A long career helps, he’s 36 now and hit the headlines as a neo-pro when he stood on the podium of Paris-Roubaix back in 2002 (pictured). Along the way he’s packed out his palmarès with plenty of crowd-pleasing results including the world championships in 2005, several national titles, stages in the Tour de France as well as three wins in the Tour of Flanders and four in Paris-Roubaix. Antoine Blondin once described Eddy Merckx as a the kind of champion “who loses when he doesn’t win” by which he meant that second place in a race might be nice for many but it was a defeat for Merckx. 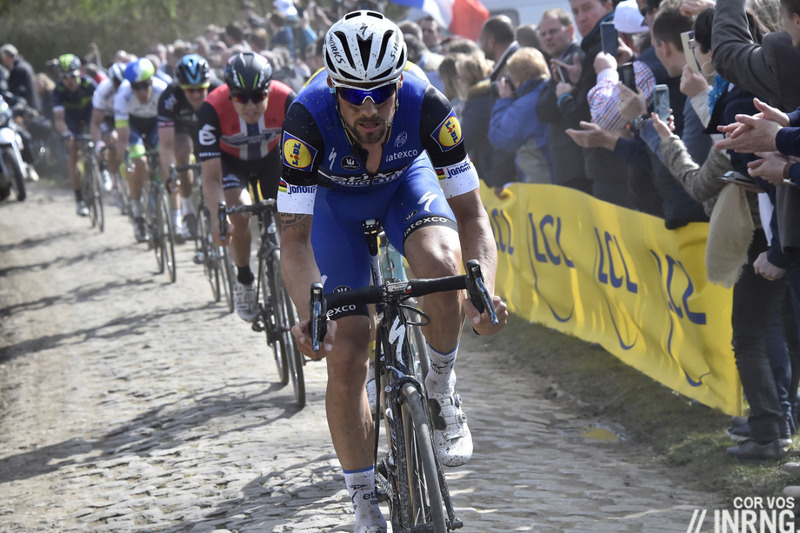 It can be applied to Boonen too, his second place in Paris-Roubaix to Mathew Hayman last year was a good result when viewed against an otherwise disappointing spring season, so much so that it persuaded Boonen to ride on for another year. Yet second place was also seen by sections of the Belgian media (here, here, here etc) as a loss that was preventable. It’s testimony to Boonen’s status that even as an active rider we’ve seen several names ventured as “the next Boonen” with Guillaume Van Keirsbulck and Yves Lampaert among the pretenders. These “the next so-and-so” labels are always too reductive and too convenient – just as Boonen wasn’t the next Johan Museeuw – but the use of the phrase points to shoes that need to be filled. Boonen’s popularity isn’t just down to time and wins, there are more subtle issues like charisma and here Boonen doesn’t doesn’t look so obvious, there’s none of the staged stunts performed by Peter Sagan, not even a wheelie let alone a viral musical extravaganza. Yet he’s regularly available to the media and by several accounts charming to interview. His popularity is also notoriety and he’s had his moments in celebrity gossip pages thanks to costly car crashes, cocaine, a tax scandal and a young girlfriend. For good or ill Boonen isn’t just a staple of the sports pages, he’s a national figure in Belgium. This suggests that he’ll retire from cycling but won’t get the quiet life as he’s part of the Belgian celebrity circuit where is private life is tracked by paparazzi. Boonen has expressed interest in a new career in motorsport – he collects supercars – and this is bound to fill column inches for years to come. 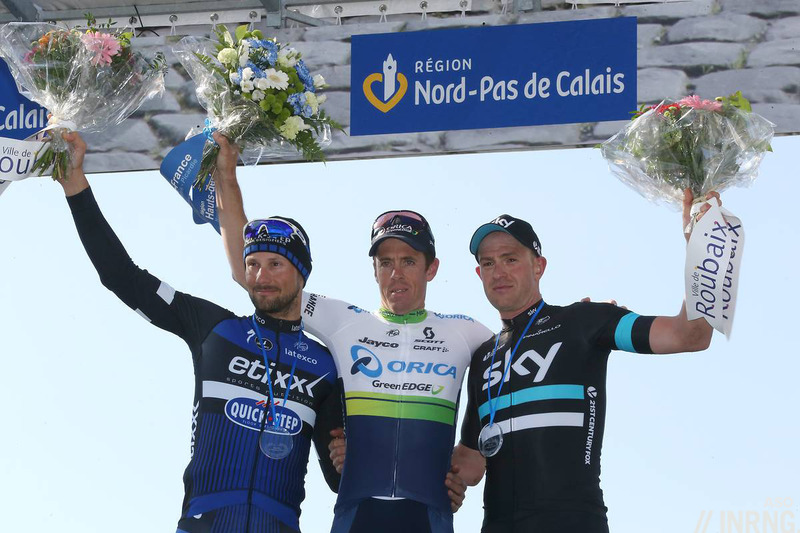 Back to cycling and the post-Boonen era brings questions for the Quick Step team. We still see them as the exemplary outfit for the spring classics even if they’ve had many several barren campaigns, or at least not lived up to the high standards expected of them. Boonen has acted as the cornerstone around which to build their tactics, able to charge away solo on his day but crucially he could play the sprint card. This enabled, or perhaps emboldened, Niki Terpstra to win Paris-Roubaix in 2014 when he had the force to ride away from the front group after clearing the last pavé sector because nobody else wanted to chase with Tommeke sitting on. There’s the looser question of identity, the team does have a Belgian core with nine riders but it’s become cosmopolitan with 15 different nationalities. Do the team persist with this footloose strategy or do they try and find a Belgian rider around whom they can anchor the team for April? Not easy, Greg Van Avermaet seems happy at BMC Racing and Sep Vanmarcke has signed with Cannondale-Drapac for two years. Even recruiting a marquee foreigner for the Flemish classics isn’t obvious; team bike sponsor Specialized craves the validation gained from a successful cobbled campaign but has Peter Sagan doing the business over at rival stable Bora-Hansgrohe now. Among the candidates for internal promotion there’s Zdeněk Štybar who is still a promising rider but also 31 years old and Niki Terpstra is a year older. Yves Lampaert should be back after injury took him out of the spring classics last year after his girlfriend rammed into him with trolley by accident during a visit to the supermarket provoking an Achilles tendon injury. These three could conceivably win Paris-Roubaix this year or the next but none are celebrated, or just rated, in the same way as Tommeke. Fabian Cancellara’s retired and now the countdown is on for Tom Boonen’s final cobbled classics campaign. His retirement will be a national event in Belgium because he’s more than pro cyclist, he’s a national celebrity. Some cyclists have stopped and taken the media circus with them but there’s no danger of this in Belgium because no other country venerates the sport so much. But Boonen’s retirement will leave column inches bare and it’ll be interesting to see what his team is planning for the coming years without him. An interest in motorsport? Can we please set up some sort of super motosport-cycling hybrid power team with Boonen, Chris Hoy and Fernando Alonso?! The ultimate merge of two and four wheels couldn’t be stopped by anyone. It’ll be fascinating to see if Fernando Gaviria can make a cobbles rider. Build a Spring team around that guy, is what I’d be doing. If you were to secure sponsoring for the next couple of seasons of course. Don’t forget that is still up in the air. But yeah, Gaviria seems to have it all. Boonen recently referred to him as ‘my friend Fernando’ and during the spring campaign he lives with a family in the same area as Boonen. I suspect they do quite some training rides together and the cobbled wisdom is being passed on already. The title sponsor is going (they could still renew) but team owner Zdenek Bakala said at the team presentation he will guarantee the team’s continuation. What this means remains to be seen and riders with contracts expiring at the end of the year, ie almost all the team, will be shopping around for a new team from March onwards. Bakala wants to get this sorted as soon as possible then – to prevent any exodus. Perhaps a small point, but amongst taller riders like myself I do believe Boonen is a bit of a hero, just because of his height. We often see cyclists who are on the smaller side winning most of the big races, so it is pretty awe-inspiring to see someone who is so tall dominate in such a ferocious and muscular manner that is usually reserved for the likes of a Sagan- or Valverde-sized cyclist. Will certainly miss watching him race and will be rooting him on during the classics. But, for me, it was the élan of the sprint finish. The coup de grace of the killer that all great athletes have. Which is why I see Gaviria as the possible heir-apparent for QS. A good pick, another of those burdened with the “new Boonen” label. Quickstep and Trek (or whatever their predecessor names have been) have long had a quiet pact between their management not to poach riders from each other though although this has been broken more recently so it could happen again. I wonder if these “next Tom’s” would rather stay away from QuickStep just to keep the pressure manageable. Stepping into the team next year as Boonen’s replacement would be a huge burden to bear, especially for a Belgian. I believe Stuyven has previously mentioned that he signed with Trek because he didn’t want the extra attention that would come with being the “next Boonen” on a Belgian team. Stybar was cyclocross world champion, so there’s no problem with the potential. He’s adapted to the road distances winning road events. First Nys retires, now Boonen. Gaviria’s potential is frightening while Stuyven and, possibly, Benoot are possibles. Looking elsewhere how about Moscon? 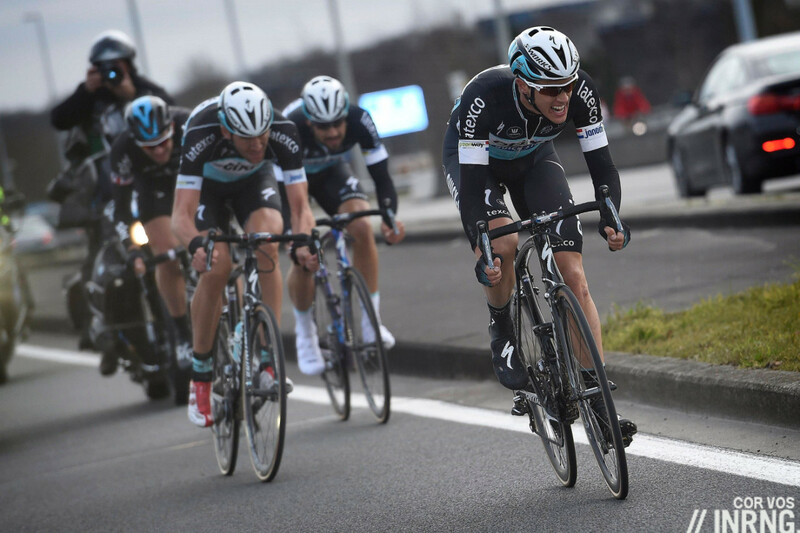 Looks to have a big engine and was in the mix at the sharp end last year working for Stannard before he slid out. For a more left-field candidate what about Matthew Van Der Poel from cyclo-cross? He always looks such a stylish rider and is very powerful. I’d love to see him giving the Classics a go. PS – I’m a big Boonen fan as he just gives the impression of being a nice, totally ego free guy, which is unusual in elite sport. When Hayman won last year he couldn’t have been more gracious at a moment which must’ve been really difficult for him. Hats off. Only 9 cyclists in history have won more than a couple of Roubaix, and only 6 cyclists in history could win more than two Ronde. Only Boonen, Cancellara and Museeuw belong to both categories. It’s impossible to say that we’re speaking of the strongest Classics riders ever, IMHO they probably wouldn’t even make a top 5 (whereas a top 10 might be more or less probable…): blame specialisation, but truth is that their palmarés is not well-rounded enough in terms of quality, which has also an impact on total quantity of Monuments and other major Classics, given their limits outside their pavé reservoir. As Classics riders in the broader sense, they’re not only behind *absolute greatest* like Merckx or Coppi, but also Van Looy, Kelly or De Vlaeminck. Yet, I think that I’d venture to say that we’re speaking of the strongest *pavé riders* ever. Sure, it’s not just about the figures – and I could only watch partial footage of the greatest candidates from the past. But the fact that, for example, Boonen and Cancellara were clashing one against the other adds weight to the profile of both: we often complained that there weren’t enough of their duels, but that’s quite normal in the Classics. On the contrary, we can say that – leaving aside any tactical hypothesis, just looking at the final one-two results – without Boonen, Cancellara would be sporting four Roubaix, and Boonen would be the lonely record holder for multiple wins in both races, with 5 Roubaix and 4 Ronde. Three direct duels may look too few (there are also the indirect ones, which I didn’t take into account), but since these races are so hard to win, their impact is huge. The only comparable situation I can recall is at the Roubaix throughout the 70s, with De Vlaeminck facing Merckx and Moser. Yes, De Vlaeminck is probably the one and only monsieur Roubaix (that might explain why he grudegs Boonen his popularity). All the same, the peculiarity of Boonen, Cancellara, and Museeuw, too, is their imposing success also in the Ronde (where those Roubaix champions didn’t shine as much), as well as in the rest of the Flemish pavé menú: Het Volk, E3 (Harelbeke), Kuurne, Gent-Wevelgem, Dwars door Vlaanderen… Cancellara, not being Belgian, is a step back when “minor” Flemish Classics are concerned (even if his 3 E3 victories aren’t bad at all), but Boonen and Museeuw are simply devastating, given that Boonen has record multiple wins both in E3 and in Kuurne (besides sharing the record in the Gent’s case!) while Museeuw has won all of them except Gent a couple of times. De Vlaeminck and Merckx, to set a high bar, were more or less on par with such a level of performance only in Het Volk and, respectively, Kuurne or Gent. I wouldn’t even say that the rest of the rivals in recent years weren’t offering enough resistance: this is way harder to prove, and I wouldn’t even try, but a pretty much constant presence on the podia might suggest that the likes of Van Petegem, Tchmil, Ballerini, Hoste, Tafi, Flecha, Ballan, Pozzato… and several others… were enough to provide valuable competition (perhaps thing are softening just a bit in very recent years, five or so, precisely because of the generational shift, with Terpstra and Vanmarcke as the most consistent figures, while Sagan, Van Avermaet, Degenkolb, Kristoff, Stybar et al. are all called to prove they can grant continuity to their top results, which I’ve got no reason to doubt – but, let’s see). All in all, I’m pretty much convinced that without being “the strongest Classics riders ever”, and without even being “the strongest Roubaix riders ever”, we’ve had the privilege to watch “the strongest pavé rider ever”, Tom Boonen, racing along with two other excellent candidates for the podium places in this peculiar category, that is, Museeuw (Boonen was obviously more a successor than a rival) and Cancellara. Despite growing specialisation, I’d also underline that their huge class allowed the three of them to achieve significant results also outside of their favourite hunting grounds (way more than most of their road rivals, say, Van Petegem, Flecha, Nuyens, Ballan, Hoste etc. ): Cancellara, no need to say, was an outstanding cronoman, and had a special feeling with the Sanremo (a race that Boonen really should have won, just as Cancellara is lacking a proper World Road Race Championship… like De Vlaeminck! ); Museeuw was way more similar to a true Classics all-around rider, with victories in the hard Züri Metzgete, or Amstel, or Brabantse Pijl, Hamburg, Paris-Tours, surely prompted by the importance which the World Cup still had (for the same reason, he also contested Liege or Lombardia, achieving some placings just outside of the top-ten); Boonen has been a more than decent sprinter, in his younger years, grabbing a final green jersey at the Tour. So many times, in many sports, I’ve got the impression that present day feats of multiple triumphs are fostered by a marketing factor which impulses the institutions to create favourable conditions. The sensation of “we’re watching the strongest ever” sells quite well. Cycling isn’t immune, especially when we’re speaking of GTs (especially the more marketing prone – and succcessful – among them). +1 gabriele. Cogent and fully formed thoughts. Glad you still post on here: always knowledgeable, realistic and enthusiastic. + 1. Thank you for taking the time to share your knowledge and give a modern historical perspective, Gabrielle. It’s much appreciated. Although I had read of and been told about the adulation for Boonen in Flanders, I was still surprised when I witnessed it first hand. It’s very difficult to measure, of course, but I wondered if you or any one else had a perspective on that as compared with earlier Classics champions. Gabrieles comment sent me checking. The next in line behind his “big three” are Merckx 2 Ronde and 3 Roubaix, Van Looy 2 Ronde and 3 Roubaix, and Van Steenbergen 2 Ronde and 2 Roubaix. Of course RDV won 1 Ronde and 4 Roubaix but this is a bit unbalanced particularly when in the Ronde victory he was towed to the line by Freddy Maertens. Anyway does seem to be a bit of a generational thing here with Museeuw, cancellara and Boonen being 1993 onwards and the others covering the period 1944 to 1975. Made me wonder why? Increased specialisation as the earlier guys tried to win everything (Merckx, Van Looy and RDV won all five monuments)? Or changes in the courses (more pave in Roubaix, more bergs in Flanders) making the pool of potential winners smaller? When discussing strongest “Classics” riders ever versus “Roubaix” riders, it is important to remember that both L-B-L and Lombardy have been altered in the past 20 years to more highly favor strong climbers. L-B-L had a long, relatively flat, run to line after La Redoute (great for Kelly and those all-arounders before him) and Lombardy as well (plenty of hills but time to catch back on before the line; remember that Tafi has won Lombardy). I was going to say the same thing. Lombardy the last couple of years has had over 4000 metres of climbing. On a GT stage with a similar profile you’d expect Boonen et al to be rolling in with the bus 40 minutes down. Even Gilbert and van Avarmaet don’t stand a chance there any more. It’s interesting that the Ardennes Classics have been lambasted on here for a few years for having similar and predictable finishes. This year Amstel has ditched the finish at the top of the Cauberg. It’d be good to see a similar change at LBL. Mike, I get your point, but I can’t agree on several aspects, especially when Lombardia is concerned (and that’s because I don’t know the history of Liège’s course in detail). The Lombardia always used to display very demanding courses, even if its changing nature allowed different options from time to time, including the odd easy race. Which means, on the one hand, that heavier riders might have seized their occasion, when a slightly easier course was available (like Tafi did), and, on the other hand, that if some Classics riders, proficient in Roubaix or Ronde, too, could win Lombardia’s mountainous editions, they were simply more complete or generally *stronger* than present-day pavé champions. I analysed the Lombardia situation throughout the years elsewhere in this blog (maybe answering to Richard S? ), but I can be even more specific, adding that, for example, De Vlaeminck got 2nd in 1973 and then won in 1974 (more than 40 years ago) an over-3000-mts-altitude-gain edition, on what was one of the typical Como routes, with three significant climbs in the last 60 kms and the hard S. Fermo finale we’ve also seen in recent years. 1976, his second victory, was just marginally easier, since they took away some 300 mts of altitude gain in the first part of the race. His rivals were the likes of Gimondi, Merckx, Thévenet, Panizza, that is, strong stage race riders who loved uphill roads (Panizza was a pure climber and normally a luxury gregario in GTs). The same is true for Moser or, it goes without saying, Gimondi and Merckx themselves. A decade later, Sean Kelly showed his prowess winning on three very different courses and getting a narrow second place just 15″ behind a strong climber like Baronchelli in 1986. In 1991 Kelly won again a difficult edition, with nearly 3000 mts of climbing and a finale which mimicked the Coppa Agostoni’s, with the steep Lissolo some 20 kms to the line. I would have said that the Como finale was harder, anyway, but the selection was dire: only four riders arrived within 2 minutes – note that Franco Ballerini, another famous “monsieur Roubaix”, was among them. I really *don’t think* that Kelly or De Vlaeminck have achieved a more complete palmarés than Museeuw, Cancellara or Boonen because of the route design, at least when Lombardia is concerned – and I won’t even start to discuss Merckx or Coppi. If Lombardia wasn’t enough to extrapolate, we can check GT results, too. I think that Kelly is a self-evident case (4 top ten at the TdF, half of which were top 5; as many top ten in the Vuelta, among which a victory, plus a podium and another top 5). Believe, me Kelly didn’t really need that much *long or flat runs* to the line. De Vlaeminck is less known as a GT rider, but he went for the Giro between 1972 and 1975: he scored 7th, 11th, 11th and 4th. They were the golden years of Merckx at the Giro, clashing against strong climbers like Gimondi, Baronchelli and the legendary KAS Spanish riders, El Tarangu Fuente and Galdós. The 1975 Giro had been designed to favour climbing specialist Baronchelli and was one of the heaviest-loaded ever in terms of climbing. De Vlaeminck put in strong performances on several dreadful climbs, winning the Dolomitic Queen Stage, performing strongly on La Maddalena or Monte Bondone and defending himself decently on mythical Gpm like the “Pantanian” Ciocco (uphill ITT) or the Stelvio. Moser, dominating the Roubaix from 1978 to 1980, had several Giri designed for him in the 80s, but when it wasn’t at all the case, in the first half of the 70s, he was already doing great (he finished the Giro 11 times, and he didn’t make the top ten only on two occasions, one of them as a neo-pro; he went only once to the TdF and the Vuelta, making the top ten in both cases). Rik Van Looy might be object of debate, since he won a quite easy edition of the Lombardia, indeed, and suffered in the others (I don’t know about the Liège, where he was more consistent, besides his only victory). Yet, once again, give a look to his GC results in GTs. Well, GTs perhaps included less uphill finishes, but you had a hell of climbing. Van Looy sports two top ten at the Giro, one at the TdF and two Vuelta podia. I can’t examine them in detail, but 1959 Giro might be the perfect example: Van Looy, who won some 7 stages of all sorts, really lost a deserved podium with bad… ITT performances, both in the short Vesuvio uphill ITT and in the 50 kms long flattish ITT in Piemonte, whereas he showed himself pretty strong on the uphill finish of Abetone, as well as in the hard Appennino stages to Arezzo and San Marino (with Bartali’s Consuma or the dreadful Eremo); he even won the downhill finish to Rovereto right after the terrible Pian delle Fugazze climb from Valli del Pasubio (8 km avg. 8.8%) and he was a fotofinish 2nd in Bolzano after Brocon, Rolle and Costalunga. He entered the stage 19 flattish ITT 2nd placed in GC, some 90″ behind Anquetil. He lost 4’11” to the Frenchman, 2’10” to Gaul. Ok, in the Val d’Aosta 300 kms long mountain stage (the two San Bernardo and the Forclaz) he lost 5′ to Gaul, but so did everyone else except strong climber Imerio Massignan – in fact, Van Looy crossed the line in 5th place! And his final 4th place in GC was ahead of Massignan himself. I can’t see today’s pavé riders going even near to such a level of performance. Blame specialisation – maybe – but the changes in race courses aren’t really the main variable, here (and I’ve shown elsewhere that, in the last ten years or so, strong Ronde/Classics riders can put in strong performances in a hard Lombardia, even if I’d agree that the last one was a step above). Dear Gabriele – Nice critical review of Lombardia. Thanks. You should consider being a cycling journalist as I rarely read such thoughtful and detailed info on mainstream sites (INRNG the exception of course). I tried to follow LBL closely in the late 80s and the Argentin era (have had a chance to ride many of those climbs too). The course was always difficult but the race finished down along the river. I remember lots of small (3-5 riders) group sprints that were initiated with savage attacks on La Redoute and small groups could stay away. Even a big guy like Dirk De Wolf was able to win. I think that the “cobble specialist” Cancellara could have won, on more than one occasion, on those LBL courses. Thank you very much, Mike. I’d really consider becoming a cycling journalist, but I’d need someone who pays me a living for that 😉 (I’ve been doing that as a hobby or to help friends through the years, but a serious commitment needs a wage, at least when you’ve got bills to pay). A journo career is, well, a career, you usually go through steps, practice, fill CV lines, know people and so – and, since I’ve been having a very different career until now, it’s not so easy to make the switch. Besides, as a language-based job, I’m afraid that I’d need to stick to Italian, or Spanish at most. And in Italy and Spain the situation of journalism is awful. Some 40% of the Italian journalists are currently working *for free* (on a zero euros wage). However, even with today’s course you can see that slightly heavier riders, a little under or above the 70 kgs mark, might find their way to victory or podium. Vinokourov, Kolobnev, Voigt, Iglinsky, Albasini, Armstrong, Pascal Richard etc. Few historical winners were heavier than that, even if, for sure, the average weight was higher. What’s sure is that the last decade saw further specialisation, with La Roche aux Fauçons perhaps being a turning point. However, the “perhaps” is needed, since Gilbert was performing well in both Ronde and Liège, plus (this is quite fanciful) I’d have been personally curious to see, in a parallel universe, Valverde and Nibali racing more on the cobbles. All in all, I’m quite sure that the course isn’t the main factor: I pointed out, answering to Richard S, the relevance of *peaked* calendars and, probably, something as elusive as *mentality*, that is, DSs and riders attitude to stick to a given script. PS When speaking of L-B-L and its identity, we shouldn’t forget that, despite being the Doyenne, its “real” history started in 1959-1960, probably, as Nick noted elsewhere on this blog, because of its inclusion in the Super Prestige. Until then, it was essentially a national race of reduced international scope, which means that it’s hard to define its characteristics. Suffice it to say that in the decade before, 70% of the riders in the final top-20 were Belgian, a figure that suddenly dropped to 56% in the following decade, right after the inclusion in the Super Prestige. And imagine that the data are slightly shifted by the “Kübler years” when, mainly between 1951 and 1954, for a short spell big names were showing up and making top-ten results (besides Ferdi, you had the likes of Bobet, Robic, Bartali, De Filippis)… but, soon after, you were again having 80% Belgian top-tens (and I referred to top-20 above to show that it wasn’t about the Belgian being a head above the rest, it was about the rest not racing). Which is to say that, all in all, “Classical” L-B-L might have lasted some 32 years, while the “modern” version is already 25 years old – soon it will be hard to say which is the most *proper* Liège. Very interesting Gabriele, and I take your point with regard to Lombardia routes. I’d say a factor is that a lot of climbs are packed into finishes of hilly classics now, and they never have a flat finish. If you had a Lombardy with a 60k flat run in, or a LBL that finished in town like it used to then I think you’d certainly at least see the lighter end of the cobble eaters like van Avarmaet, Gilbert, Stybar and Thomas challenging, maybe even Michael Matthews and Sagan. I think a bigger factor that rules out modern cobbled classics specialists from winning in Liege or Lombardia is their weight, which would be a part of their increased specialisation. De Vlaeminck and Kelly, and Van Looy and say someone like Freddy Maertens, although classed as classics men weren’t of a particularly different build to the GC men of their day, though De Vlaeminck was quite tall. They probably just had more fast twitch muscles and a greater ability to churn out high power for a long time. Nowadays Cancellara, Boonen and Sagan look like they play a completely different sport to Nibal, Aru and Froome. This is probably because they can afford to be more specialised now. Back in the day Kelly, De Vlaeminck et al will have been dependent on year round success for income, and had to stay light for the GT’s. There wasn’t a living to be made from being good between February and April, with the odd stage or time trial here and there. Modern sports science probably plays are part here too, and nutrition. Some of these guys also did the rounds in the summer crits and even the cyclo-crosses or six-days in winter-time. Agreed with your point about weight, I was thinking the same. I’d add the question of *peaking*, which in modern cycling is more evident than ever. For example, I’ve been giving a look to Cancellara’s career since he was 23, and he typically needed to “rest”(avoid racing) for more than a month after his Spring campaign, which nearly always ended with the Roubaix. He tried Amstel a couple of times and he never made the first *fifty* places. In fact, his ideal rest time away from racing was between five and six weeks (as he did in 2004-2006): when he tried and came back in less time – which meant resting a month, anyway, except in 2009 – his performances were subsequently quite disappointing until June. From 2012 on, age and injuries took their toll, and the stops tended to become longer, while, at the same time, high-level performances came back later in the season. I chose to examine Cancellara’s case since I feel he could might have been a better candidate for Ardennes than Boonen: however, with modern cycling training techniques, he would have needed to completely change his calendar, besides losing some 4-5 kgs. And sometimes, in nowadays cycling, you’ve got the sensation that the former has become way harder than the latter! I agree completely on the economic question you hint at, too. On the other hand, I’m not sure about the subject of long flat final sections. Better said, I think that their effect would be way different in modern cycling than it was before the 90s. Back then, only a few men came back to the front, even with tens of flat kms to the line. Truth is that, more often than not, the strong men – despite being “Classics riders” – didn’t need to come back, at least those in better form, becuase they made the cut in the first place, along with the climbers or GT riders (and that was because of the question of physical types you define in the following paragraph, where IMHO you really nailed it). A huge part of the problem is gregari-related: back then, the difference in performance between captains and gregari (or second-line captains) appeared to be greater, which meant that you had to wait a lot of time to gather a significant chasing group which might give you an advantage in number over the leading group. If the attackers are two or three, but so are the chasers (or even, say, 4-5), you can throw in as much flat terrain as you want, the former might even increase their advantage! The summit of the performance pyramid was way more sharp: hence to form a group of, dunno, fifteen chasers, you were probably losing several minutes. Nowadays, even against a strong attack, a lot of gregari or lesser teams captains (but the worst thing is that the latter, which at least may create tactical dilemmas, are being increasingly bought to enter the first category), well, they lose just a little time, which means that they can be waited by the main men without much of a loss or a risk, in order to collect the advantage in numbers plus the strategical benefit of not needing to work since your gregari will do that. Look at the 2011-2014 Lombardias… (horrible routes, IMHO). A lot of altitude gain, yes, but the only serious selection always happened on the last little climb (a boring script, where the presence of the last steep slope made things worse, not better): you didn’t even need 50 flat kms, with just 20-30 flat kms it was enough to keep together a 30-40 men group until the last uphill sprint. That’s why I think that if modern trends go on, with a “flattened” performance pyramid (it looks like that there are some signs of changing in recent years), we need to transform the courses in order to respect the spirit of the race. In Lombardia’s case, a hard, very selective race, which favours strong GT riders with Classics skills or Classics rider with notable long-climbing qualities (I agree with you that we shouldn’t tilt too much the balance to exclude the latter… but, perhaps, we just hadn’t the guys with the right specs in a particular race). In Liège’s case, I’d say that we should go for riders who can produce repeated intense relatively short (but not too short) climbing efforts, with an accent on *acceleration*. It’s Galdos, not Galdós, actually (whatever some websites might say). Galdós was the writer. Paco Galdos was the cyclist who didn’t win the Giro atop the Stelvio. Bundle, I hadn’t checked and I wrote like that since that’s how I say it, because of the influence of the writer, no doubt. Yet, I’d like to ask you how do you know for certain. I’ve now looked around and even if I’ve seen it both ways in several Spanish forums and websites, I’ve found press articles from his time which wrote it “Galdós” (including a scanned 1966 ABC article, which excludes later corrections by modern journalists). The funny thing is that El País in 1979 wrote “Galdós” in February and “Galdos” in July. I’m not saying that this means anything, journalists (as everyone else) have written names wrong for centuries. We also must consider that Spanish obviously didn’t include “tildes” when writing in capital letter until relatively recent years, which means that images or titles with the word “GALDOS” don’t matter. Back then, no one ever pronounced “Paco Galdós”. If you go to Vitoria, you can go to his pizzeria and ask him personally. But the mistake must have been common at that time, too, otherwise the ABC and El País journalists wouldn’t have written it like that (in Spanish there’s no ambiguity between written and spoken form, except – back in the past – in case of capital letters, and it wasn’t these articles’ case). If people had been calling him by his wrong name throughout his long career, I suppose he would have corrected the issue. But of course, stranger things have happened. Possible misunderstanding: no irony on my part about the pizzeria, the smiley was friendly. It was really what I wanted to know, that is, a reference to a reliable first-hand source. The mistakes in the press can have any sort of explication, indeed (I also meant it, when I said that journalists get names wrong – just click CN anyday 🙂 ). When the ABC piece was written, Galdos was very young and pretty much unknown; in the case of El País, the cyclist was already a star, but OTOH the journalist (now recently re-elected as President of the Sport Press Association in Madrid) was then very young, some 22 or 23 years old. Happy to have a doubt solved. Do you have a link to that Boonen trance track? Just one tiny detail (sorry to point that out…), the publifin scandal is not related to flemish public finances but to Walloon’s. Really nice article on Boonen’s popularity in Flanders. He has been popular since his 3rd in last Museeuw’s Roubaix (JM told him as his successor after the race,…). When he won his 1st Ronde, he really became THE hero. When he completed the race, TV speaker of Sporza said something like “the new cycling pope has arrived”. Great moment. They have their own Publifin scandal in Flanders; same s**t, same MO, but called Publipart or something. It’s the way Belgians do things – or so I’ve been told. Amazing, though, how some sportsmen can break through that wall and be genuinely popular and deeply admired on both sides (but, of course, ten times more so on their “own” side). Always been a fan of Tom and enjoyed his racing career, a little sad that another “era” passes. Would love to see his car collection. And those bad boy early days with the coke and the car crash – did you see the dolphin paint-job?! – certainly helped his status. But obviously it’s his results that really make him a star. Like Contador, when he makes a move everyone – riders / spectators / commentators know that the race is now ON. Like someone says above, he has that devasting killer instinct. Perhaps Bakala, Specialized and Sagan should have got together last year and made plans for them all to come together in 2018, post-Boonen. Sagan’s never had a great team behind him and is probably the most likely to truly take over Boonen’s dominance – although he has yet to prove himself in P-R.
It’s interesting that you say Boonens charisma isn’t as obvious as Sagans because he doesn’t do all the cringey stunts that Sagan does. I would say that’s evidence of the opposite. For all that Sagan is top dog and very marketable I’ve always got the impression he tries a bit hard, like a kid showing off. Boonen doesn’t need to, he just gives of an air of confident and calm coolness. That’s charisma. What next for Boonen? Is there a Belgian version of Strictly or Celebrity Big Brother, or even The Jump? I’ve felt over the last few years that Boonen’s begun to be the opposite of Merckx “who loses when he doesn’t win” – it feels like his second place last year has made him even more likeable. His misdemeanours also seem to have have made him appear more human at a time when the top riders come across as automatons. Maybe that’s just an image from afar over here in GB and not shared by the Belgians? I think that his human reaction after the race made him more likeable, indeed, but truth is that the huge race he technically threw in last year was what *really* confirmed his status as an impressive champion. I can’t see him being *less* appreciated if he won that sprint, not even a little bit. Going that close to winning when you’re not in the form of your life, just turning the race to your favour with an exercise of creativity, courage and strategy, plus going beyond your physical limits when needed (like he clearly did to close on Hayman’s attack). All that, resorting to generosity in effort instead of, say, bullying riders with a lesser status (yes, Cancellara, I’m thinking about you and Sep – a lot of cunning and iron will, but not that magnanimous, I’d say). Note that I consider mental games as a fine skill in cycling, and allowing Hayman all that time on the back wasn’t an example of optimising your winning chances: I mean, I don’t blame Cancellara’s style, they’re just different attitudes. All the same, Boonen’s approach helps in building up that image – it might be a mere image, but that’s all we’ve got – of a rider for whom a certain way to race or to conceive cycling is more important than victory (also think about him working together with Cancellara in Ronde 2010, a nonsense from a strategic POV). The logical consequence is that, besides being an “overwinner”, he looks now beyond victory or losing – at least, that’s how it feels outside Belgium (I couldn’t say about the Flemish press or fans). Should the ‘many’ not be there? You beat me to posting the details of this new song, thanks for the extra detail and context on Hermans who has long been a strong rider on hard, hilly courses but seems to have stepped up a level with the summit finish win over the weekend. I feel he already took a big step in the first half of last year’s season but then got injured. What about Edward Theuns or Wout Van Aert to take over that mantle? Brilliant article and comments. I wonder, does Purito deserve a good-bye article? (I know this blog is – quite reasonably – Belgophile, and it wouldn’t need to be here). Maybe just me but feel there’s a lot to say!